This is a 3mm width cubic zircon stone inlay full circle classic eternity titanium ring, band style, comfort fit design, stone inlay finish. 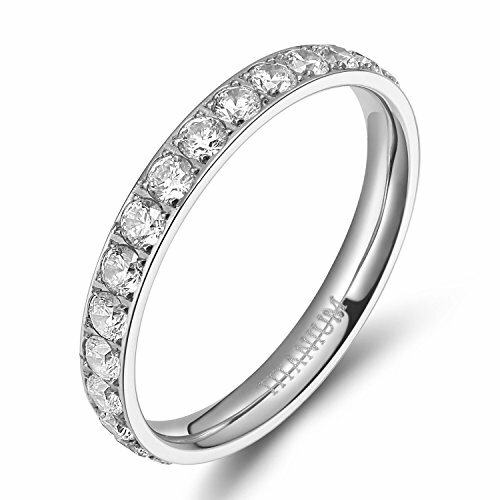 This sparkling 3mm ladies infinity Cz wedding band ring features A+ quality round cubic zirconia stones set in pave setting all the way around the ring. Classy and elegant design combined with carefree nature and durability of stainless steel, this ring offers you the enjoyment of any fine jewelry. usually this width is for girl/women's use. it can be used as wedding rings/bands, anniversary rings/bands, engagement rings/bands. It could also be adorable mini gift on Valentine's Day, Birthday, Christmas, etc. If you have any questions about this product by TIGRADE, contact us by completing and submitting the form below. If you are looking for a specif part number, please include it with your message.